The show takes the central idea of sending Cole back in time in an effort to save humanity â€“ and proceeds from there. X-Men star Aaron Stanford stars as Cole while Amanda Schull takes on the role of Cassandra Railly. I may not be raging and wanting to gouge my eyes out at having seen the trailer, it also doesn't inspire much excitement. That said, who doesn't love a conspiracy theory/dystopic future story? I'm cautiously optimistic. 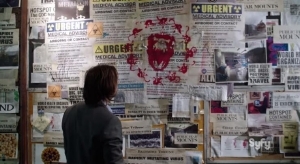 12 Monkeys will premiere on Syfy in January 2015. I like many had high hopes for SYFY back in the dim mists of time. It's had some good shows and some worthy efforts. I'm afraid this will not rate in either category. This deeply saddens me.